Selective Coordination is a design requirement newly added by both the 2005 and 2008 National Electrical Code® to Article 700 Emergency Systems (see 700.27), Article 701 – Legally Required Standby Systems (see 701.18), and by the 2008 NEC to Article 708 Critical Operations Power Systems (see 708.54). These Articles also apply to Health Care Facilities as noted in 517.26. Prior to 2005, Selective Coordination was only required for some elevator applications by Article 620. For sections of systems falling under Articles 700 701 and 708, the Engineer is responsible for selecting overcurrent devices such that only the device directly upstream of the fault will trip. This differs from traditional typical coordination and coordination studies that attempted to minimize the chance of nuisance trips where a fault may open more than one device. To design a Selectively Coordinated system, the Engineer must choose pairs of overcurrent devices whose time current curves do no overlap in either the thermal range or the instantaneous range up to the current available at the downstream breaker. Example: A 20A branch breaker feeding egress lighting per 2005 NEC® 700 must selectively coordinate with all upstream devices. The 20A breaker is in a branch panel that has 2500A of available fault current. To selectively coordinate, only the 20A breaker may trip under this fault – this means that the next upstream device must not trip with 2500A of current prior to the 20A device opening. The smallest device with an instantaneous trip that will not operate at 25ooA (including the tolerance band) is a 4ooA thermal magnetic or a 3ooA solid state circuit breaker. That second breaker must in turn coordinate with the next upstream device at the fault current level available at that second breaker, and so on, up to and including the service entrance overcurrent device. When the system is being powered by the emergency source, the coordination must now be calculated based on the new available fault currents, in most cases sourced from an emergency generator. The Siemens Selective Coordination Tool will identify commonly used Siemens circuit breakers whose trip curves do not overlap for the conditions selected by the Engineer. The Tool will identify coordinated commonly used breaker pairs for up to five levels of distribution. In some cases, Siemens has additional devices and solutions available for especially difficult design conditions – please feel free to contact your local Siemens Consultant Account Manager for additional assistance and options. 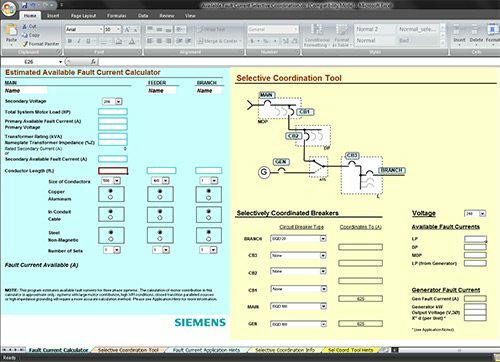 The Siemens Selective Coordination Tool is based on data for Siemens circuit breakers that may or may not be similar to products by other manufacturers. We suggest noting on the panel schedule the Siemens breaker suggested by the Tool and calling for an equivalent product for other approved manufacturers. Inclusion of the Siemens breaker type and size will provide some of the information needed to select the alternate product. The choice of selectively coordinated devices requires calculation (and frequently recalculation) by the engineer of the available fault currents at various points in the system, and often requires resizing panels, switchboards, conductors, conduits and other system components – this redesign can not be done during the bidding process, and can be extremely costly if done during construction. 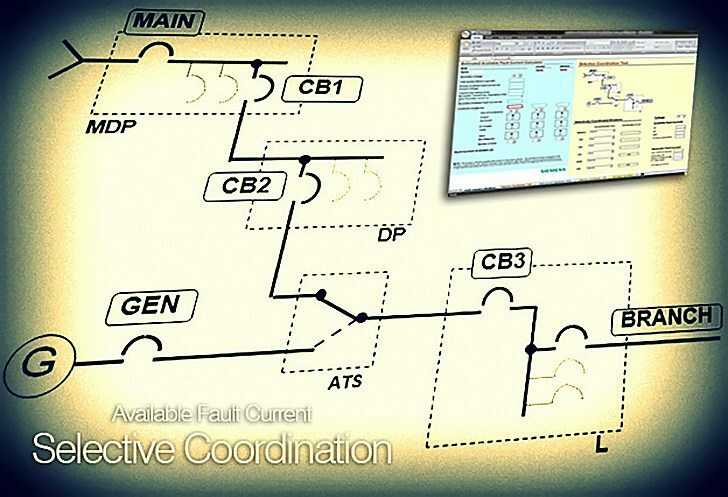 For this reason, the Engineer is responsible for selecting and calling for the correct selectively coordinated devices – please let us know if Siemens can assist you! Very good information.Thanks.Required in more details,Please. did not find the excel sheet, even after registering. Download link works just fine and is located above screenshot. Haven’t used it yet, but thanks!